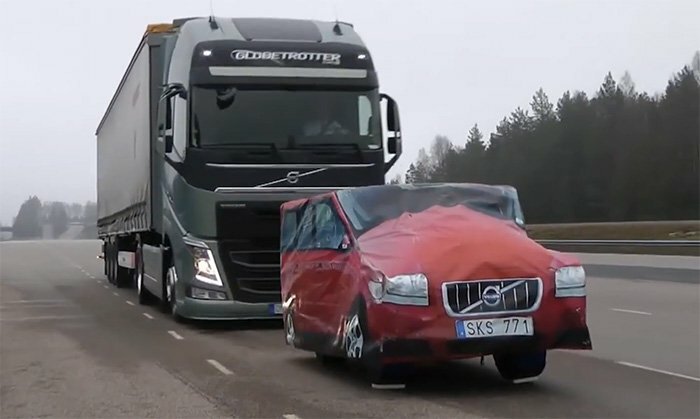 Volvo's new braking system allows it to stop a 40-ton semi on a dime. On average, over 3,200 persons lose their lives in road crashes every day. But this only represents a small fraction of people affected by these accidents. An additional 20-50 million people suffer different degrees of injuries and disabilities every year. There are many factors that could lead to a road traffic accident. Automobile manufacturers constantly work to ensure automobiles are equipped with technology that can make them safer. This is particularly important if the industry’s dream of self-driving cars is to be realized. Volvo has grown to become one of the most innovative companies in the automobile industry, particularly when it comes to heavy-duty vehicles. One of their novel technologies is the new collision warning and early braking system. The braking system is powerful enough to stop a fully loaded semi-truck. The company released videos that showed a semi-truck equipped with the novel braking technology. The truck was loaded with 40 tons of cargo, and it stopped by itself on a dime! Many truck accidents result from a loss of forward road vision, usually due to inattention or distraction. The collision warning and emergency braking system is designed to support the truck driver in order to prevent tragic accidents that occur owing to a loss of forward vision. During a critical situation, the head-up display on the truck’s windshield would be illuminated. If there is still no reaction from the driver, the display starts to flash, giving off an audible alarm in the process. Without any response from the driver, the braking system is automatically activated albeit with a low braking force. If the situation remains critical and the truck driver is yet to respond, the emergency brakes are activated and the truck is brought to a halt. The much-needed support provided by this technology could help avoid many road traffic accidents. A panic braking situation could cause a road traffic accident. However, the new Volvo collision warning with emergency brake alerts other drivers whenever there is a panic braking situation so they can take action. The brake lights on the truck would change from fixed to blinking during a panic braking situation. This change also occurs if the panic braking is initiated by the truck driver. With developments like this, the Volvo Trucking Company reiterates their commitment to achieving the ultimate goal of ‘no accidents with Volvo trucks’. Beyond this, however, the success of the emergency braking system provides a template on which giant strides can be made. The company is already developing a self-driving truck and you can expect that the truck would be equipped with the emergency braking technology. It feels good to know that the drive towards achieving autonomy on the road is not limited to personal cars.